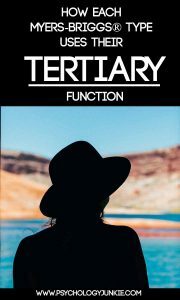 In the personality community, one of the least talked about functions is the tertiary function. There are many theories for this; one being that there was a lot of disagreement over the direction of the tertiary function. Many typologists used to argue that the tertiary had the same attitude as the auxiliary function (extraverted if you’re an introvert and introverted if you’re an extrovert). Other arguments state that there just isn’t enough information available to get very in-depth with this particular function. Because there’s such a lack of information available online, I decided to read through all my typology books and gather any data on the tertiary function I could find. This article should give you some easy ways to identify your tertiary function and understand how you use it (and how others do!). What Is the Tertiary Function? There are several names or titles for the tertiary function. Personality Hacker calls it the “10-year-old” because they believe that it has roughly that level of maturity. Psychologist John Beebe called the tertiary function the “Eternal Child” after one of Carl Jung’s archetypes. Many other typologists call it the “relief function” or “relief role”. What Does the Tertiary Function Do? The tertiary function can develop anywhere from the teens to mid-life depending on the person and their own maturity and health. Even at a young age there will be moments where the tertiary function “shows itself” in consciousness, but not often. We generally use the tertiary function to be playful, creative, explore, and recharge. It backs up and supports our auxiliary function and often works in tandem with it, especially as we get closer to our 20’s and 30’s. Often in adulthood we find ourselves drawn to activities that utilize this function; using it feels good, feels natural, and is usually relaxing or refreshing. The third function can also be one we use in a childish way if we’re not careful. Because it won’t have the same level of maturity that the auxiliary or dominant functions do, we can waver between using it effectively and using it in an immature way. We can find ourselves becoming flustered or confused when we try to use this function under pressure, and we may feel vulnerable or “silly” because we can’t seem to harness it with the strength we’d like to. We can also become over-confident with this function and believe ourselves to be much more capable with it than we actually are. This usually comes back to haunt us later when we realize with hindsight that we weren’t acting mature. According to psychologist John Beebe, who created the 8-function type model, the tertiary function shows how we like to be comforted and cared for. We will be taking that into consideration when we describe how each type uses this function. IXTJs usually have a very strong “gut” feeling that something is good or bad, right or wrong. This sense of morality and ethics grows and develops throughout life. In their younger years, IXTJs might experience Fi in an irrational way; for example, they might misread other people’s intentions and hold onto grudges and hurts longer than other types (although this isn’t always the case). They might distrust value-based decisions and feel irritable around people who use that mode of decision-making. They will still use Fi as a way to be honest and true to themselves and their goals and ideals. They hate inauthentic behavior, manipulation, or things that seem phony or showy. As IXTJs get older they find themselves experiencing increased interest in activities that align with their values; things like volunteering, advocating for the less fortunate, or reading or writing poetry. They may find themselves sifting through their beliefs to find out what fits them personally and what fits with their vision and personal growth. As this function develops ITJs develop a certainty and resolve about what is important, honest, and worth doing. Because IXTJs don’t have as advanced use of Fi as IFPs or EFPs they may find it unsettling or disruptive at times. They can attack or look down on other people’s value-systems without taking the time to consider their point of view, or they may become self-righteous and judgmental in moments of stress or passion. They can also risk becoming so wrapped up in their own subjective values and life path that they lose sight of the needs and values of other people. This can make them seem selfish to other types and can cause a great deal of conflict. Not all IXTJs will succumb to these issues, but it’s something to look out for. The tertiary function is often the one we prefer to be comforted with. We may comfort ourselves by using this function or we may appreciate other people who use this function in a mature, healthy way. For this reason many IXTJs are drawn to FP personality types. FPs use Fi in the dominant or auxiliary position and so tend to have mature use of Fi (if they are healthy). ITJs can find comfort in the sincerity, compassion, integrity, and authenticity of Fi-users. They can find their listening skills, personal resolve, and focus on morality a steadying force in their lives. IXFJs develop an innate ability to find logical inconsistencies and flaws. They can find joy in analyzing, categorizing, and evaluating data according to logical principles. IFJs can struggle with using Ti effectively in their younger years, because it tends to be rather immature and unconscious. It isn’t until they reach their teens or even their 30’s that this function develops very well. As a result, young IFJs can struggle with forming objective conclusions and using impersonal analysis. They may explain things through their ideals, passions, visions (for INFJs) or experience (ISFJs) without using logical data to back up their assertions. They will still use Ti occasionally as a way to analyze, theorize, and state their ideas as accurately as possible. They may find themselves being nit-picky about which words they use to convey a point. As the tertiary function develops, IFJs find themselves increasingly drawn to activities that allow them to solve problems, categorize, analyze, and understand underlying frameworks. They may take up an interest in complex strategy games or brain teasers or they may analyze and categorize the various complexities in life and find logical frameworks and patterns. They will usually employ Ti alongside their dominant or auxiliary functions. INFJs will use Ti to help name or piece-together their abstract hunches and insights. ISFJs employ Ti alongside Si to analyze past experience and learn from it. Generally IFJs will try to find a way to use Ti in a diplomatic way (alongside Fe). If they spot a logical inconsistency they will try to find a tactful way to come alongside and help people see those inconsistencies. Because IFJs don’t use Ti with the same maturity and development that TPs do, they can run the risk of using it in an unhealthy or imbalanced way. They may become so wrapped up in using Ti (because it feels comforting to use) that they don’t balance it alongside their other functions. They may feel an urge to be reclusive and ignore anyone who rejects their truths and principles. They can also become rigid and critical of other people and lose their signature empathy and tactfulness. If they get stuck in a Ni-Ti or Si-Ti loop they can become withdrawn and prone to pointing out other people’s errors and discrepancies without seeing their point of view. The tertiary function is often one that we enjoy being comforted with. During times of stress IFJs might employ Ti to “get away” from their stressors and find balance. They can also be drawn to people that have Ti in a dominant or auxiliary position (like TP types). Being around Ti-users can feel comforting to IFJs because they enjoy the calm resolve these types have. They may find solace in their ability to think objectively and solve problems without being conflicted by feelings or value-judgments. IFJs often find the steady-headed nature of Ti comforting and can enjoy analyzing problems with Ti-users to a great degree. ESXJs develop an interest in interpreting situations and relationships across contexts and finding meanings and interconnections that are more abstract. This interest usually develops in their 20’s or 30’s. In early life, ESXJs don’t have a lot of access to Ne because it is still largely unconscious and underdeveloped. They tend to be skeptical of unproven, theoretical, or “mystical” senses of knowing. They will trust tried-and-true methods and proven facts over abstract hunches or unknowns. Brainstorming and talking about the distant future can be very tiring for them because they’re more focused on the needs of the moment. They will have brief moments of Ne activity as it tries to become more conscious, and this will usually result in a fascination with new ideas or a sense of limitless potential in the world. Depending on an individual’s level of maturity, the tertiary function tends to develop anywhere from the late teens to the mid-30’s. ESXJs in this stage of development enjoy a keener insight into what “could be”. They are quicker to pick up on hidden meanings and new ideas and can enjoy brainstorming to a great degree. They can also be energized by connecting the details of all their experiences and learning about the unknown and theoretical. They may enjoy using Ne in a playful way, to find clever connections between things and create unusual, one-of-a-kind projects. They may use Ne in the business world to find new possibilities and opportunities. Because Ne isn’t as mature and developed for ESXJs as it is for NPs it can be used in an unhealthy way. They can find themselves overwhelmed by a million possibilities and feel trapped when it comes to deciding which is the best one. Because EJ types are driven to decide quickly, they may come to a decision that is less than ideal and is disappointing to them. They can also misread signals and hidden meanings and jump to conclusions that are inaccurate. They may also try to close off their Ne so as not to disrupt their sense of security or threats to their belief system, even if these threats might be a good thing. The tertiary function is often one that we enjoy being comforted with. For this reason, ESXJs may comfort themselves during times of mild stress by brainstorming possibilities or ways out of their stress. They may try to find a new idea that will console them or inspire them. They may also find it stimulating and comfortable to be around NP types. Their enthusiasm, imagination, and eye for possibility can be greatly inspiring. ENXJs develop a keen ability to react to the outer environment in the present moment. They learn how to experience and notice outer details and make the most of what’s happening “right now”. In early life, ENXJs are not greatly in tune with the physical world. They tend to care little about tangible pleasures and activities unless those activities fit in with the big picture or their goals. They may feel physically awkward at times or they may miss details that other types (especially SP types) do. As Se gradually becomes more conscious, ENXJs find an increasing joy in physical activity and experiences. They may take up an interest in sports, and may become quick at reading cues in the outside world. They may also trust their physical impulses and instincts more fully. As the tertiary function starts to develop and become more conscious, ENXJs find a growing desire to connect with the physical world. They may enjoy playing an instrument, trying new foods, exercising, dancing, etc,. They may be quick to notice details in the world around them and see opportunities and activities that others don’t. They may start to place more importance on their appearance and staying physically fit. They can orient quickly to their environment, noticing relevant facts and details and using them to their advantage. Because Se isn’t as mature and developed for ENXJs as it is for SPs, they run the risk of using it in an unhealthy or imbalanced way. They can become distracted by irrelevant details and activities in their environment and allow it to throw them off course. They can also become over-indulgent at times or too impulsive, desiring to follow their instincts but doing so in a way that isn’t healthy or productive. They may be overly concerned with their appearance or making an impression on the people around them. Many people find comfort in their tertiary function. For this reason, ENXJs may seek out physical activity and experiences when they are in the midst of stress. They may turn to exercise, stimulating music, or recreation to ease their mind. They may also find comfort in the presence of SP personality types. They can find their awareness of the moment, resourcefulness, and sense of adventure fascinating. They can enjoy engaging physically in the outer world with SPs and trying out new experiences and hands-on activities. ISXPs develop an ability to foresee implications, decode symbols, and predict likely effects. They become quick to notice abstract potential and can be drawn to the archetypal and mysterious. In early life, Ni is still very underdeveloped and unconscious for ISXPs. As a result, they may distrust their hunches and ignore symbolism or strange senses of “knowing”. They may be skeptical of people who foresee future possibilities and can prefer to focus more heavily on the moment and practical realities that they can see, touch, taste, and smell. As Ni becomes more influential and more conscious, they may suddenly start to realize they have an inner potential and vision that they want to make a reality. As Ni becomes more and more developed, ISXPs become more imaginative, conceptual, and pulled towards the mysterious and symbolic. They seem to just “know” how things will play out, and they are determined to make their vision a reality. They will use long-term strategic thinking to pursue their goals and will take into consideration symbolic, mysterious hunches and dreams. Imagery and archetypes become more fascinating to them and they may become more philosophical and focused on theoretical and abstract possibilities. Because ISXPs don’t have as developed use of Ni as NJs do, they can risk using it in unhealthy or imbalanced ways. They tend to feel a push and pull between using it and repressing it. They can become locked into a vision and ignore their usual sense of realism, or they can ignore symbolic meanings and hunches that might do them good. They can also become stuck in a Ti-Ni or Fi-Ni loop and lose sight of current realities and needs. This process is usually relatively rare, though. All personalities tend to seek comfort and relief in their tertiary function. For this reason, ISXPs experiencing mild stress may enjoy looking to the future, finding hidden meanings, and looking for symbolic connections between things. It’s very common for ISXPs to enjoy the company of NJ personality types. The abstract insights and big-picture, symbolic thinking of the NJ can be comforting and fascinating to them. There are always exceptions to this rule, of course. As INXPs grow and develop they become skilled at reviewing and recalling past experiences. They can enjoy collecting details and remembering favorite moments with great accuracy. In early life, INXPs can struggle with remembering details and noticing internal-body sensations. Conversely, they may put too much stock in their own personal experience and disregard other people’s experience. In childhood, Si tends to come and go in negative and positive ways. One moment they will be very detail-oriented and grounded and the next moment they may be very forgetful of what happened just a moment before. This can be especially frustrating for them when they’re trying to recall information for a test or in the classroom. As Si develops and matures, INXPs enjoy using it to a great degree. They may find joy in revisiting favorite places, watching favorite old movies, and re-listening to their favorite songs over and over. They may grow interested in their family history, their cultural history, and researching the past. They may collect memorabilia and find comfort in familiarity and routine. They will enjoy accessing their vivid storehouse of memories and recalling favorite experiences in detail. Because INXPs don’t have as developed use of Si as SJs do, they can risk using it in unhealthy or imbalanced ways. They can become overly focused on details and then switch to paying little or no attention to details. They can become caught up in the past, especially past mistakes, and feel paralyzed by it. They can also become overly sentimental about objects and have difficulty getting rid of things that might have a personal meaning. They may also become so locked into their own past personal experience that they shun new opportunities that could be good for them. Each personality type tends to find comfort and relief by accessing their tertiary function. For this reason, INXPs may enjoy revisiting favorite past experiences when they are stressed. They might find comfort in an old song or remembering a favorite moment in time. They also can enjoy the presence of SJ personality types because of their natural tendency to employ Si readily. They can find their consistency and detail-oriented nature comforting. There are always exceptions to this rule, but it does tend to be the case most of the time. Even though EXTPs are thinking types, they tend to develop a strong skill at connecting with others and understanding their moods. As Fe develops they can easily navigate social settings, understand emotional atmospheres, and exude a natural “charm”. In early life, EXTPs tend to lack an awareness for the moods of other people. They can be tactless and grow impatient with the emotions and values of others. They may also be more affected by other people’s opinions of them then they want to be. This is especially irritating to them because it contradicts their natural desire for independence and impersonal logic. As Fe develops, EXTPs become more socially aware and skilled at making other people feel comfortable. They tend to feel responsible for the needs and emotions of others and can become very protective if their loved ones are being mistreated or bullied. They develop an unsettling (to some) ability to read what’s going on with other people. They may intuitively know how other people are feeling and how to make them feel better. They can also use this skill to be unstoppable salespeople or to convince people using emotional “strategizing”. Because Fe isn’t as developed for EXTPs as it is for FJs, they still can feel uncomfortable or confused using it at times. They may have difficulty expressing their feelings for others or they may forget to express concern for the needs of others. They may also use Fe as a way to manipulate other people or get the reaction or result they are aiming for. All personality types tend to find relief and comfort in their tertiary function. For this reason many EXTPs find that connecting with others, giving and receiving affirmation, and swapping preferences and opinions is a way to relieve stress. They can also enjoy the company of FJ personality types who tend to exude a natural warmth, empathy, and awareness of other’s needs and moods. As EXFPs grow and mature they find a skill and joy in organizing, segmenting, and systematizing projects. They can become especially goal-oriented and aware of objective logic in their decisions. In early life, EXFPs may struggle with organization and follow-through on projects. They may be forgetful, miss steps, or start and leave tasks unfinished. They can also struggle with maintaining objective logic and may have a hard time balancing their eagerness to pursue new possibilities with a logical mindset. As EXFPs age and mature, they develop increased skill with Te. As a result, they can be quick to notice when something isn’t functioning right, when things are disorganized, or when a project can be streamlined in a more organized way. They want to use measurable facts and objective logic more readily in their decisions and can usually explain themselves in a decisive and logical way. Long-range planning becomes easier for them and they become better at finishing their projects and maintaining efficiency. Because EXFPs don’t have as developed use of Te as TJ personality types do, they risk using it in an unhealthy or imbalanced way. In their efforts to be objective they may become overly blunt and tactless. They may also become overly-confident when using objective logic spontaneously only to find that their arguments aren’t as well thought-out as they should be. Each personality type tends to find comfort and relief in their tertiary function. As a result, EXFPs tend to seek organization, logic, and efficiency when they are feeling out of control or stressed. They may try to streamline their projects or utilize time management techniques so they don’t feel overwhelmed. They may also enjoy the company of TJ personality types more and more as they get older. The direct, decisive, logical nature of TJs can be a relief and a comfort to them as they find themselves pulled in many different directions. How have you used your tertiary function? Do you relate to these examples? Share your thoughts in the comments! These specifics make consider MBTI with a new light. I think that my tertiary Ni has always been like a navigational star, one that direct and confirm. What some call “auspicious star” or “the good star”. That sounds wonderful, I love how you describe that! Does this mean that our personality type is not set until we grow older?